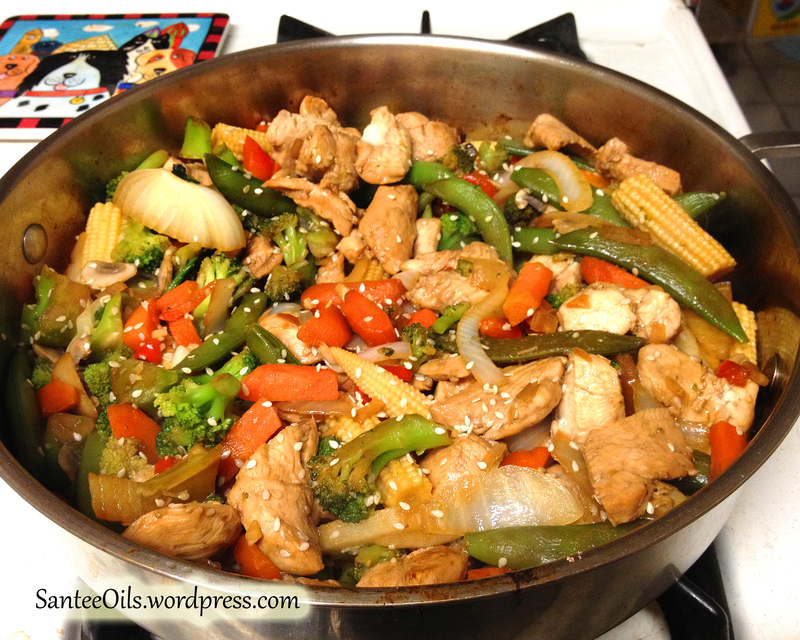 Ginger Chicken Stir Fry – the perfect solution! I’ve been making a conscious effort to add more fruits and vegetables to my food intake recently (and less processed foods). There are even more organic items in my kitchen, but that is for another blog post). But how does a non-cook who works too many hours find the time or the knowledge to do this? Easy. Simple. No-brainer. Those are a few of my must-haves when I look for inspiration. Last night the answer came to me as I was thinking how to use the last of the chicken breasts waiting in my ‘fridge. Stir Fry! How perfect a match is that?! There is no real recipe to follow, you can use almost any veggie and it will taste delicious. Want to be sure you get the most pizazz out of your Stir Fry without a hassle? I used a base of frozen “Asian Medley” veggies and added a couple of fresh choices for more variety in the dish (for me, the more flavor in each bite means I can go without the noodles or rice). And my crowning touch: I rubbed 1 drop of Ginger Essential Oil (from my favorite brand line) on each side of the chicken breast before I sliced it for cooking. I topped the whole beautiful dish with sesame seeds and everything came together perfectly for me. YUMMM! Hints: stir fry chicken first with 1:1 soy sauce/water mixture (I used about 1/8 cup each). The water will reduce off during the cooking and allow for better soy sauce flavor. Once cooked, remove the chicken and wipe out the pan before starting the veggies. Cook on high and a regular skillet is a bit thicker than most woks, providing better heating. Cook with another 1:1 mixture. Start with the veggies that take longer to cook and add the softer veggies near the end. Once cooked, reduce heat, add the ginger chicken back to the pan, mix thoroughly. Sprinkle with sesame seeds and enjoy your creation! Easy, fast, simple and healthy! Share with us in the comments below how YOURS turned out! Other Blogs – thank you! NOTE: The advice shared in this site has not been evaluated by the FDA. The products and methods recommended are not intended to diagnose, treat, cure or prevent any illness or disease, nor is it intended to replace proper medical help. Understand that essential oils work to help to bring the body into balance – thus helping the body’s natural defenses to restore homeostasis. Essential oils are not used to “treat” medical problems. Check with your physician before starting any exercise regime. Practice Gratitude and Smiling every day!